Using Facebook groups to rideshare is a bit like gambling: sometimes you win and get a ride, but most of the time you lose and are left stranded and powerless. 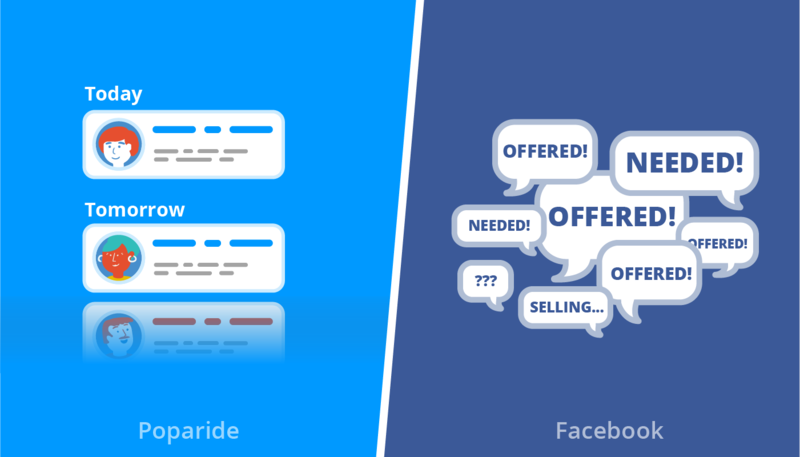 In this article, we explain the benefits of using Poparide vs Facebook groups for ridesharing. All trips are listed chronologically and you can search using an origin, destination and departure date. The number of seats left are updated on-the-fly, so you know how much space is left or if the trip is full. Prices are clearly indicated, as well as pick-up location and vehicle type. There is no spam, and only serious trips are allowed to be posted. You’ll be able to find your perfect ride in seconds, without worrying whether it’s legit or not. No need to think about carrying cash, change or going to the ATM. All Poparide trips are paid online via credit card, and drivers are paid once the trip has successfully been completed. Our cancellation policies protect both passengers and drivers and ensure a reliable service for everyone, by holding Poparide members accountable. Just book your seats, hop on and enjoy the ride! We want to ensure everyone feels safe when using Poparide. This is why all our members have to provide real information on their profile and leave reviews on their experience after each trip. Each Poparide member has a unique, verified profile that displays their real name, a clear picture, reviews they have received and information from their social media profiles. No need to keep track of where someone messaged you: on the Facebook post, through Messenger or as to your phone number. Or, even worse, remembering which one was a “maybe” or a “yes”. It gets messy! On Poparide, all communications are done directly on the app (free download for iPhone and Android). Each booking includes a messaging feature, and each conversation is related to a trip. It’s really easy to see who’s booked and who needs a response. Cell numbers are shared automatically once a booking is approved, in case the driver or the passengers don’t have access to data once on the road. Facebook groups sometimes haves admins who have volunteered their time to monitoring the group, but in most cases they’re not able to provide consistent support, because they’re busy! On Poparide, our support team is available 7 days a week, and is dedicated to monitoring the platform and responding to inquiries. There’s always someone here to help in case something happens. On Poparide, we have a fair cancellation policy that protects drivers and passengers from cancellations, and creates accountability in the community. We also curate members and remove the bad actors, to ensure a quality service for everyone! If a driver cancels a trip with approved passengers, they receive a cancellation review on their profile. If a driver cancels more than one trip in six months and they are at fault, we reserve the right to close their Poparide account. If a passenger cancels less than 24 hours before departure, the driver receives a compensation of 50% of the booking’s price. If a passenger doesn’t show up, the driver receives 100% of the money. Sign up as a driver or a passenger, it’s free! Got a question, feedback, or suggestion on Poparide’s benefits over Facebook groups? We’d love to hear it! Leave a comment below.